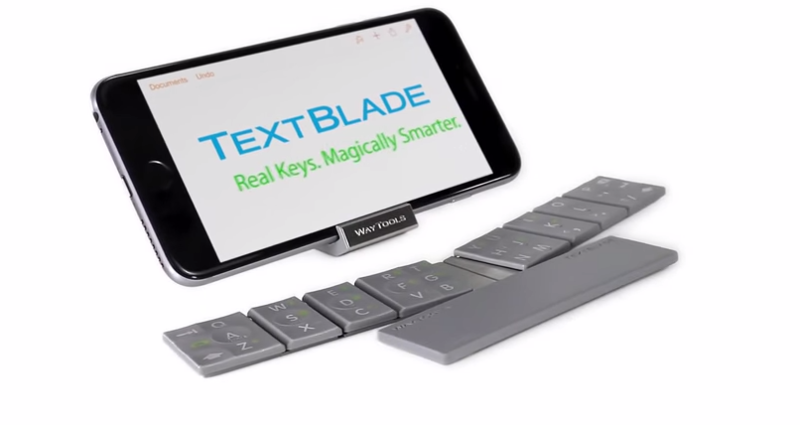 WayTools surprises the tech enthusiasts and the Smartphone users, who complain about the space consuming on-screen keyboards, with a tiny eight key QWERTY keyboard called TextBlade. Users need not worry about the portability of TextBlade since it is ultra portable with its 42.5 grams weight. This super tiny keyboard will cave into ones pocket just like a USB. Despite its petite size, TextBlade comes with full size multi layer keys and desktop finger spacing for comfortable typing experience. Now one may wonder how it can be super tiny with eight full size keys. It is made possible because TextBlade can be folded easily into three parts, two keyboard halves and a space bar. The two keyboard halves are connected magnetically. The eight keys clasps all the regular keyboard alphabets, numbers and special characters with each of eight keys carrying more than one symbol or alphabet. It uses patented multi touch key technology, which can identify the position of finger when a key containing more than one symbol is pressed. The TextBlade keyboard makes use of shortcuts like space bar which is used for typing numbers and symbols. These shortcuts facilitate considerable improvement in user’s typing speed. The battery that has a small USB dongle which serves the purpose of charging is contained in spacebar. This battery is rechargeable and single full charge will have a life of about one month. The function key is placed on the lower right side of the spacebar. Pressing here will activate the function key. These extra elements may be the reason why the spacebar looks a little heavy compared to the other two parts of TextBlade. TextBlade is a Bluetooth keyboard made for iOS and Android devices. It tethers with other devices via Bluetooth 4.0. It is compatible with devices like iPad Air 2, Air iPad 4, 3, Mini iPhone 6+, 6, 5s, 5c, 5, 4S , most of the Android devices and Samsung S5, S4, Note 2, Note . TextBlade will be available for purchase at $99 around March. One will need to place pre-orders to grab this impressive product. Hypertext Transfer Protocol (HTTP) Version 2.0: Surf the Web Faster than ever.